Organised by Christ For The Nations UK, hosted at the Royal Norfolk Hotel, and running from the 20th - 27th September 2009, the second annual Bognor Regis Bible Week was fantastic. God spoke clearly and powerfully through all the speakers encouraged all those present to seek after His kingdom and to walk in His righteousness. We can highly recommend both the morning sessions, given by Raymond Pfister, and the evening sessions given by Chrissy Gisbey, Nick Spencer, Derek Tidball, Martyn Atkins, Adrian & Bridget Plass and Dennis Greenidge. Raymond spoke excellently on the Beatitudes, reminding the listener that we must first and foremost come to listen at the feet of Jesus and hear what He is saying. All of the studies are available on CD and MP3. All 12 studies given at the Bognor Regis Bible Week 2009 are available as a 12-Disc set. At only £27.50, this collection represents a fantastic bargain! The MP3 CD of all 12 of the studies given at the Bognor Regis Bible Week 2009. All 5 of the morning Bible studies given by Raymond Pfister going through the Beatitudes and the teaching of Jesus. All 6 talks by Raymond Pfister including the 5 morning Bible studies and the Monday afternoon talk on 'The Ministry of Reconciliation and the Future of Europe'. The first of the morning Bible studies from the Bognor Regis Bible Week 2009 on the teaching of Jesus in Matthew 5. 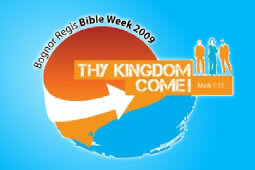 The second of the morning Bible studies from the Bognor Regis Bible Week 2009 on the teaching of Jesus in Matthew 5. The third of the morning Bible studies from the Bognor Regis Bible Week 2009 on the teaching of Jesus in Matthew 5. The fourth of the morning Bible studies from the Bognor Regis Bible Week 2009 on the teaching of Jesus in Matthew 5. The fifth of the morning Bible studies from the Bognor Regis Bible Week 2009 on the teaching of Jesus in Matthew 5. The Monday Afternoon session from the Bognor Regis Bible Week 2009. The Sunday evening session from the Bognor Regis Bible Week 2009. The Monday evening from the Bognor Regis Bible Week 2009. The Tuesday evening session from the Bognor Regis Bible Week 2009. The Wednesday evening session from the Bognor Regis Bible Week 2009. The Thursday evening session from the Bognor Regis Bible Week 2009. The Friday evening session from the Bognor Regis Bible Week 2009.